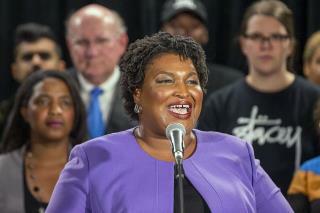 (Newser) – It's over in Georgia: Stacey Abrams called a press conference Friday to acknowledge that Republican Brian Kemp will be the state's next governor, reports Politico. But Abrams made clear that she thinks Kemp, who oversaw the election as secretary of state, is guilty of foul play. "To watch an elected official who claims to represent the people in this state baldly pin his hopes for election on the suppression of the people’s democratic right to vote has been truly appalling,” Abrams said, per the Atlanta Journal Constitution. How thoroughly modern. She didn't get her way, so she makes a big stink. You have to wonder if she even knows what an election is. Its not an entitlement program for aspiring pols. She's going to ruin her future prospects by acting like this.